Challenger hot pressed reinforced abrasive cut-off wheels provide outstanding performance for most foundry cut-off applications, but especially for the cutting of large gates and risers where heavy feed pressures or heat build-up within the cut make cold pressed wheels unsuitable. Rilled (record grove) sides for cool, free-cutting action give less operator fatigue and more cuts per hour. High-strength fiberglass molded into the Challenger wheel provides high resistance to breakage. 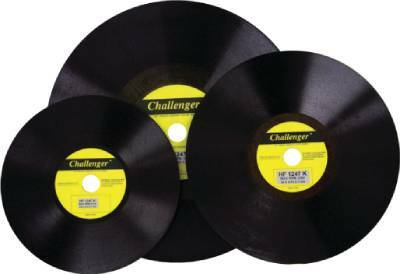 Challenger hot pressed straight and depressed center wheels are available in popular sizes for swing-frame and chop-stroke machines, with diameters ranging from 16 to 30 inches. For product specs, please see pages 12-13 of the Allison Abrasives brochure. 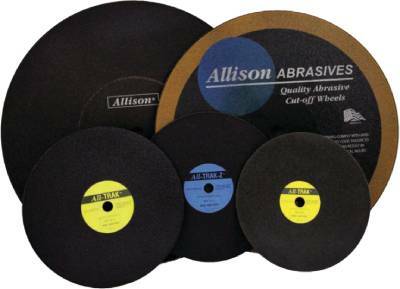 Because they are specifically designed for use with coolant Allison abrasive wheels provide unsurpassed quality of cut for metallurgical specimens. They quickly produce cross-sections that require little or no further treatment before metallographic examination. The structure and metallurgical characteristics of the specimens are not disturbed. The Allison wheels listed on the next page should be used on abrasive cut-off machines that provide abundant flow of coolant to the wheel and to the specimen being cut. Wheel speeds of 5,000 to 10,000 feet per minute (25-50 m/s) are commonly used for this type of cutting. However, the maximum rpm marked on each wheel should not be exceeded. Parts commonly cut include forgings, axles, gears, camshafts, and test slices from metal billets. For product specs, please see pages 3-4 of the Allison Abrasives brochure. 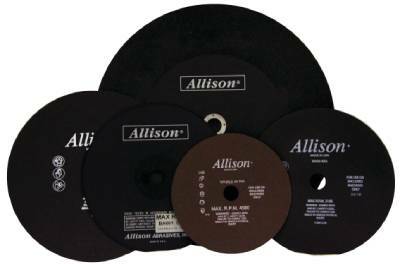 Rubber bond, fine abrasive particles, and filler materials selected to maintain a square or slightly concave cutting face make Allison abrasive cutting wheels ideal for cutting thin-wall metal tubing with absolute minimum burr. Most Allison rubber bonded heels can be used with or without coolant. Cutting with coolant provides the best cut quality, and greatest number of cuts per wheel. However, cutting with coolant provides the best quality and greatest number of cuts per wheel. Allison also offers resinoid bonded wheels formulated especially for the fast, clean, dry cutting of heavier wall metal tube and metal pipe. For the cleanest cuts, clamp tubing securely on both sides of the cut. Thinner wheels will generally provide less burr than thicker wheels. For the maximum number of cuts per wheel, and elimination of all external burr, hold the tubing securely in a chuck or similar device and rotate it while cutting. 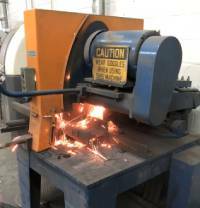 This permits wearing the wheel down to a much smaller diameter than is possible with a simple â€œchopperâ€� machine and reduces wheel cost per cut. For product specs, please see pages 7-8 of the Allison Abrasives brochure. Maintenance of railroad track includes cutting away the worn ends of used rails, and reinstalling these same rails on the same roadbed; or cutting the ends of newly rolled rails at the mill or yard before welding them together for new continuous rail installation. For â€œon trackâ€� repair of bolted-assembly rails, cutting is usually done dry on mobile gasoline powered abrasive cutting machines using 26â€� diameter abrasive wheels. We have developed abrasive wheels specifically for this operation â€“ strong, reinforced wheels, formulated for fast, free-cutting action and more cuts per wheel. They make it possible for an experienced track crew to relay more track per day than with other abrasive cutoff wheels. In the steel mill or railroad yard, stationary electrically powered abrasive cutting machines are used to trim ends prior to welding them together. 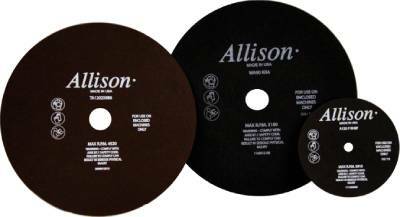 Allison wheels, for wet or dry cutting on these machines, provide fast, clean cuts and high life. They produce straight, flat cuts, ready for welding with little or no additional preparation. For product specs, please see page 15 of the Allison Abrasives brochure. The cutting of electrical contact disc from tungsten rod is commonly done wet with rubber bonded wheels 6 or 7 inches in diameter and from .013 to .017 inches thick, held to thickness tolerance of plus or minus one-thousandth of an inch. Similar wheels are used for accurate cutting of very small rod and tube sections and for cutting thin slots in various materials. Special thin wheels are also available in diameters up to 26â€�. They save money by reducing kerf loss. This is especially important when cutting very expensive materials, or when kerf loss represents a significant portion of the original material cost. Automotive parts manufacturers to cut or slot piston rings, pistons, and transmission parts. Medical and veterinarian equipment manufacturers to cut stainless steel capillary tubing (hypodermic needles) and prosthetic devices (stainless steel and titanium). Producers of dental alloys to cut cast chrome-cobalt-nickel alloys. Machine tool manufactures for slotting and cutting. The electrical and electronics industry to cut or slot tungsten and/or molybdenum contact discs, tungsten lamp filaments, alnico or ceramic magnets, and transformer cores. Slotting and disc cutting operations may be done wet or dry. Wet cutting will usually provide better quality cuts and more cuts per wheel, but dry cutting may sometimes be necessary. In either case, rubber bonded wheels are generally used since they can be held to the close tolerances required. These wheels are commonly run at approximately 10,000 surface feet per minute (50 m/s); however, the best speed is dependent on the individual job conditions and requirements. Due to the thinness of the wheels, wheel guides are a necessity for this type of operation. The guides are rigid brackets with carbide-tipped fingers which can be accurately adjusted close to each side of the wheel. For product specs, please see pages 5-6 of the Allison Abrasives brochure.